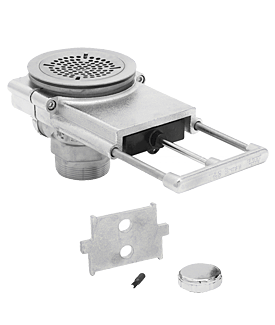 The Series B-3990 Modular Waste Drains are designed to fit sinks with a 3-1/2" drain opening. 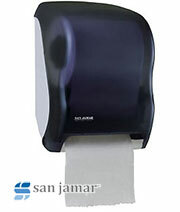 Versions with and without overflow tubes and various outlets adapters are available. 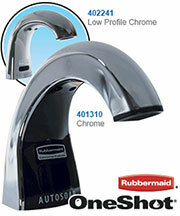 Series B-3990 Waste Drains operate by a push/pull motion of the handle to close and open the drain. Handle guard assembly for exposed applications for protection against damage from mop buckets, push carts, etc. 2. Make sure the underside and inside mating surfaces of the sink bowl in the area of the drain are clean. 3. 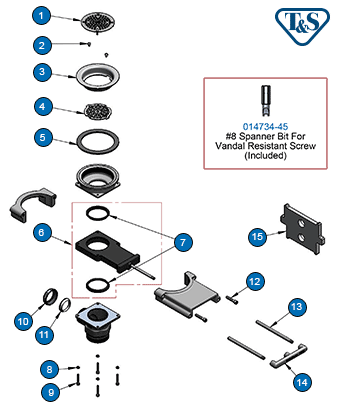 Install the Waste Drain Assembly and Gasket from below the sink. 4. Install the Sink Flange Assembly thru the sink drain opening and screw it into the Waste Drain Assembly below. 6. If Overflow is used (Figure 3) -- Install the Overflow Head in the sink. The modular design of the waste drain allows the overflow port on the Outlet to be positioned Left, Right or Back. To change positions, remove the (4) cap screws with a 5/32" hex key wrench and rotate the Outlet to the desired position. If the Outlet has been removed, ensure the Valve Seal is either in the Valve Body correctly or installed on the Outlet lip correctly. Install the (4) cap screws and tighten. 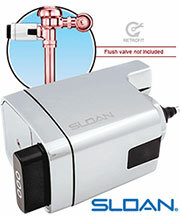 Measure and cut the overflow tube to fit into the Overflow Head and Overflow Port on the waste drain Outlet. Install the Coupling Nuts and Seals on the overflow tube. Install the overflow tube and tighten the connections. 7. Connect the drain line to the waste drain Outlet. If Outlet Adapters are used, seal all threaded connections with pipe sealant. 8. Open and close the waste drain several times to check the operation. Check for leaks.